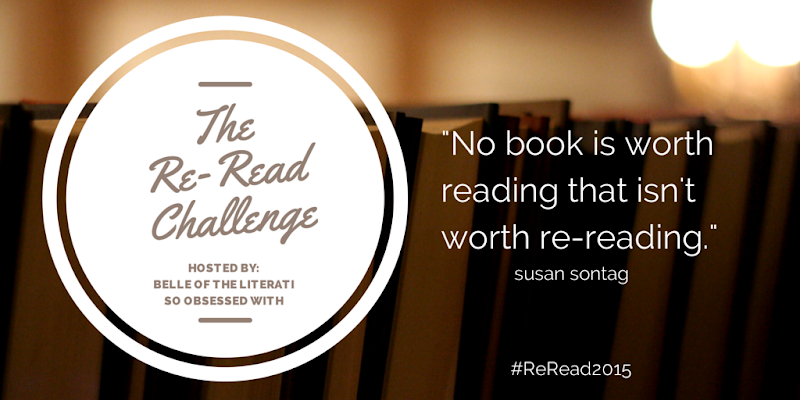 Want to take a break from your TBR? Want to relive the magic of your favorite books? Want to participate in a laid-back, no-fuss challenge in 2015? Earlier this year, I wrote a post called In 2014: I Want More & Less. The very first thing on my "More" list? Re-reading. Growing up, I used to re-read all the time. I love the comfort of returning to an old favorite or the opportunity to give a book another shot to wow you. Whether I discover new things about myself or the book, I've never regretted re-reading. Sometimes I'll like a book less than I did the first time, but usually I end up loving it even more. There's something so special about reading a book all over again! The only downside to blogging is that I'm constantly adding new books to my TBR and feeling like I'll never have enough time to read everything I want. And that often means I don't let myself re-read the books that are calling my name! I've done okay this year - approximately 20 of the 154 books I've read so far this year are re-reads - but I still wish that number was higher. So, I couldn't resist when Kelly approached me a few months ago with the idea of hosting a challenge together. Her idea was just too perfect! and to find out about the fun we've got planned! That sounds awesome! I've been wanting to re-read quite a few books lately, I've always been a fan of re-reading, but I've been too focused on reading new-to-me books this year that I haven't been able to do so. I'll be on the lookout for the sign-up post! I love this idea!!! I used to re-read all the time but now my guilt gets the better of me. I'd love to pencil in time for re-reads and getting credit in a challenge might make me feel less bad about ignoring my TBR! Hehe. I'll be looking for the details! I would like to participate in this challenge. This sounds awesome. Great idea. I'm absolutely going to be joining this! I need to get books reread - I miss them! This sounds awesome! I've definitely already started making a mental list of all the books I want to reread... lots of series :) Can't wait to join up in January! As I said on Twitter, I am SO PUMPED about this challenge. I am already thinking about favourites I would want to reread. I actually reread quite a lot (it's a habit I've fallen into in university, because my time for pleasure reading is so limited I often turn to rereading favourite books/passages), but I want to make it more of a priority to reread some older favourites and branch out. I think I generally only reread the same five books haha. Also, your timing for announcing this was so perfect with Jamie's post on rereading. Her thoughts were pretty on point with my struggles, anyway. I am definitely joining this. New to book blogging so can't wait to make the most of rereading some of my favourites and take part in the event! I love this idea! I did reread one of my favorite series growing up recently, and had so much fun with it. Crazy to think it's really the first book I've reread since I got into book blogging. I miss it though and think this is the perfect opportunity to make more time to reread next year.